I read this article and found it very interesting, thought it might be something for you. The article is called Rhode Island Red Chickens and is located at https://www.chickencoopguides.com/breeds/rhode-island-red-chickens/. Deciding to get into chicken farming is a huge step toward creating a self-sustainable homestead. Having chickens helps you ensure fresh, delicious eggs are always in your refrigerator. You can also get tasty fryer chickens from the right breeds. Plus, chickens may help reduce the population of nuisance bugs around your property with their foraging. If you’re thinking of adding a flock of chickens to your property, be sure to research the breed that will give you exactly what you’re looking for. Many farmers have Rhode Island Red chickens on their poultry farms. Rhode Island Reds are a great breed to get started with. Rhode Island Red Chickens originate from America and were first bred as early as the 19th century. They were possibly bred from wild Malay chickens in Rhode Island and Massachusetts. Many chicken farming enthusiasts appreciate them as good, versatile chickens that have many positive attributes. Here are some details about this breed. Docile Personality – Rhode Island Red Chickens have a calm demeanor. They are generally docile and are perfect for family farmers. Top Egg Producer – Rhode Island Red eggs are brown in color. Hens can produce between five and seven eggs per week. They are also an ideal chicken for meat. Distinguishing Look – In Rhode Island Red pictures, the chickens are a brownish red color. Their eyes are reddish orange, and their beak is reddish brown. Males reach about eight pounds when fully grown, and females grow to about six pounds. Strong Adaptability to Weather – This breed can thrive in almost any type of weather situation. They are known to do well in colder climates as well as warmer parts of the country. Once you’ve chosen your source for your Rhode Island Red chickens, it’s then time to figure out what kind of coop you want for them. Since your chickens will be spending most of their time in the coop, it’s important to house them in a suitable spot. Here are some ways you can ensure that your flock is living in optimal conditions. Sufficient Space – In order to produce top quality eggs, your Rhode Island Red chickens need to have enough space to live. If you plan to let your chickens roam free along your property, your coop should give them at least four square feet per chicken. If your chickens will spend most of their time indoors, give them at least 10 square feet. Safety From Other Animals – It’s important to consider safety in your coop design. 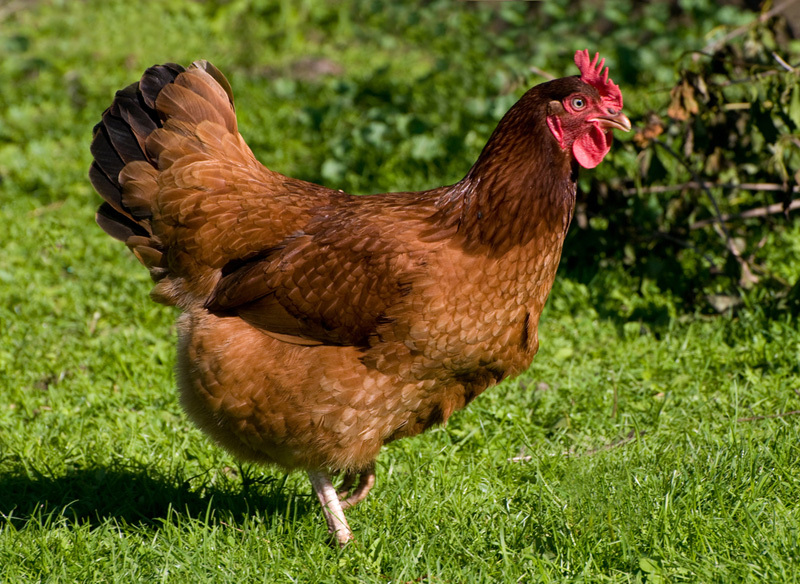 Make sure your coop space is able to keep predatory animals away from your Rhode Island Reds. Keeps Mice Away – Your chickens won’t be happy if mice and rats are allowed to burrow into the coop and steal food. Create a space that keeps rodents and other pests away. Extra Features for Comfort – If you want to get the most eggs out of your chickens, give them plenty of comfortable features, like several quiet nesting boxes and places to roost and rest. Extended Space – If you want to give your flock even more room to spread out, a great idea is to extend your coop with a chicken run. Be sure to provide plenty of opportunities for your birds to scratch and walk around in this space. Your Rhode Island Red chickens could be a great investment in creating a sustainable home for your family. Make sure your chickens are primed to be as healthy as possible with a high-quality feed and fresh water each day. Everyone can enjoy the friendly personalities of these remarkable animals and farm-fresh Rhode Island Red eggs each morning.